Sports writing ain't what it used to be. More to the point, nor is the gear used to write it with. 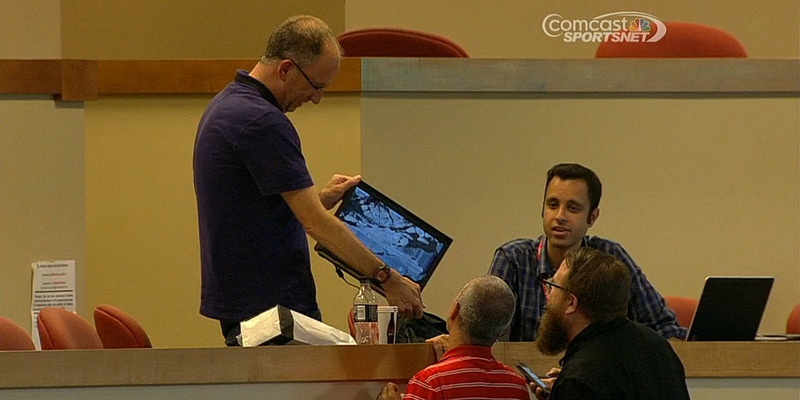 Major Baseball League Cut4 scribbler Michael Clair wrote about Cincinnati Reds beat reporter Mark Sheldon having his laptop smashed by a Pablo Sandoval foul ball in the game against the San Francisco Giants at the Great American Ball Park in Cincinnati last week. Clair ended his piece by saying: "Here's to the future when indestructible computers will hopefully be invented." Hey Clair, I've got news for you: indestructible writing machines have already been invented, a very long time ago. But you modern guys just decided to get rid of them. So if you want indestructibility, go back to find your future! Which would you want in an emergency? Real metal that can withstand the 192 pounds of a falling Jack Dempsey, or a piece of plastic crap that can't withstand a fat little foul ball? 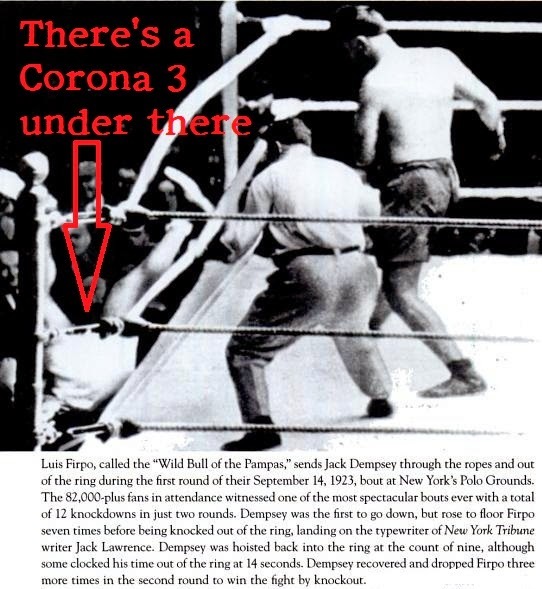 When Argentinian Louis Angel Firpo (“The Wild Bull of the Pampas”) knocked Jack Dempsey clean through the ropes in the first round of their world heavyweight boxing title fight at the Polo Grounds in New York on September 14, 1923, Dempsey landed neck and shoulder on the Corona 3 portable typewriter being used at ringside by Jack Lawrence of The New York Herald Tribune to cover the bout. 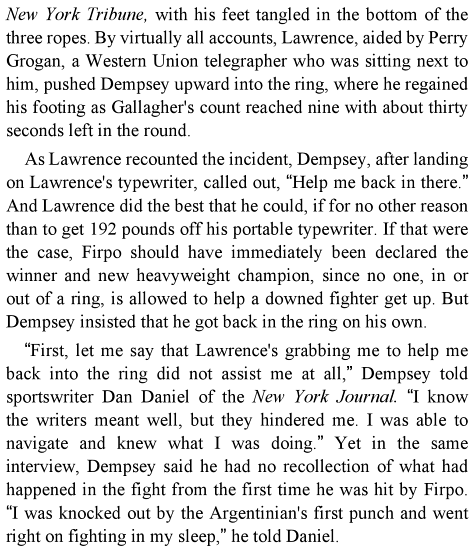 Lawrence helped Dempsey back into the ring and Dempsey promptly knocked out Firpo to hold on to the crown. Naturally, Lawrence went on writing on his non-shattered little Corona. The Corona Typewriter Company were quickly on the advertising warpath. 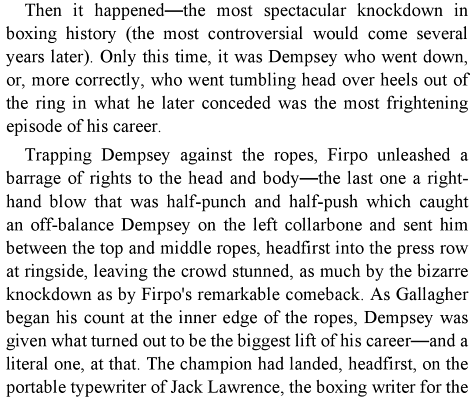 "Dempsey knocked out Firpo," the ad ran, "but he couldn’t knock out the Corona 3." 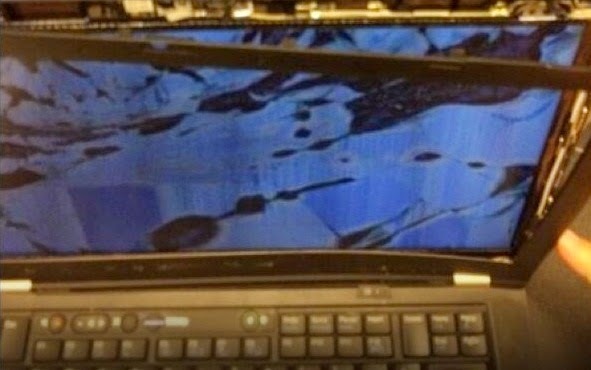 Clair wrote of last week's Cincinnati laptop smashing: "The most tragic moment is Sheldon's head droop at the end of the GIF. It's a sure reminder to thousands of people of the time their computer crashed in the midst of an all-nighter. 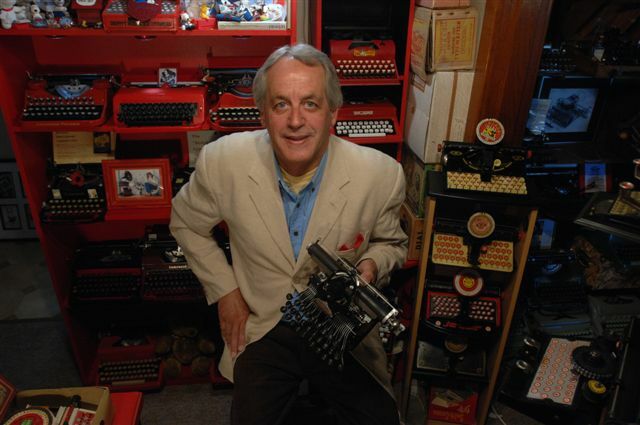 As for how the Reds reporter will finish his recap tonight, we can only hope that it involves skywriters, a court stenographer and the use of an old-timey bicycle." 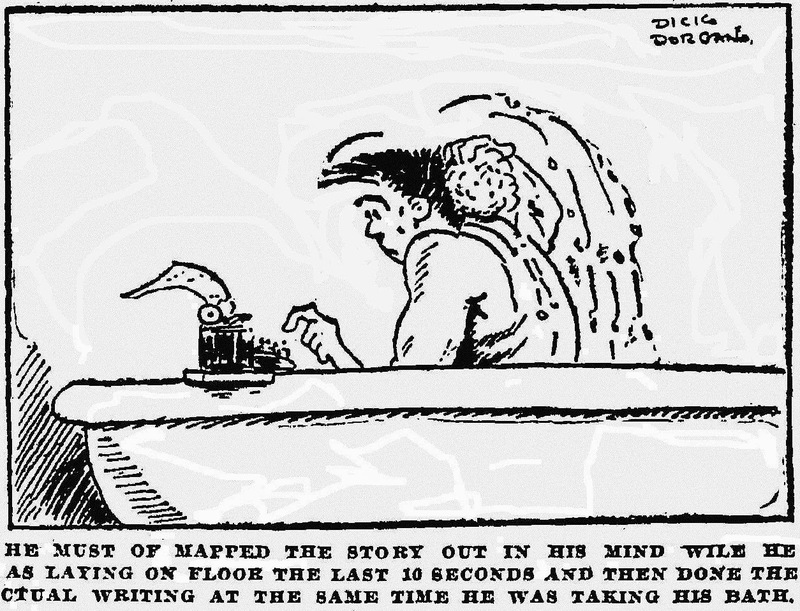 None of which would have been necessary if he'd been using a Corona 3 typewriter. 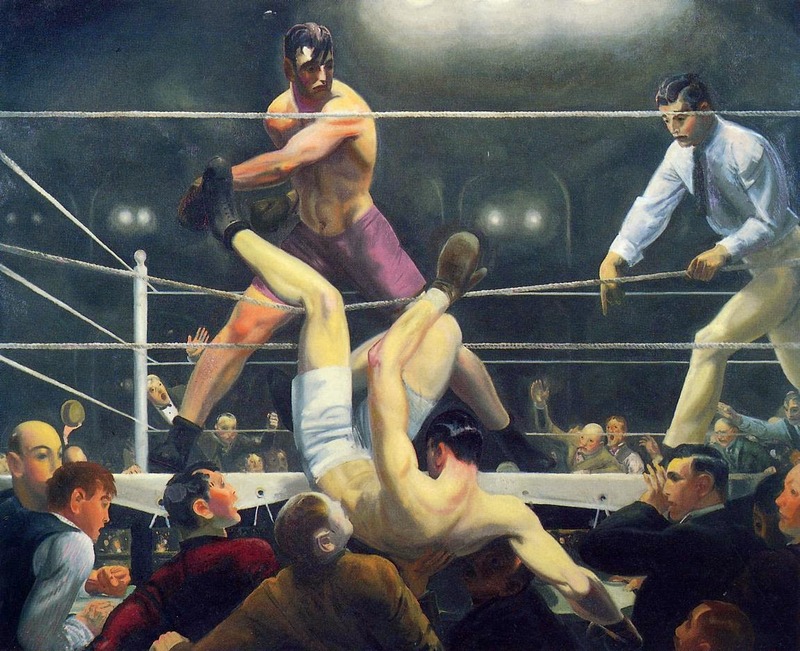 An illustration which appeared in the Indianapolis Sunday Star with Ring Lardner's brilliant and absolutely hilarious column on the Dempsey-Firpo fight. 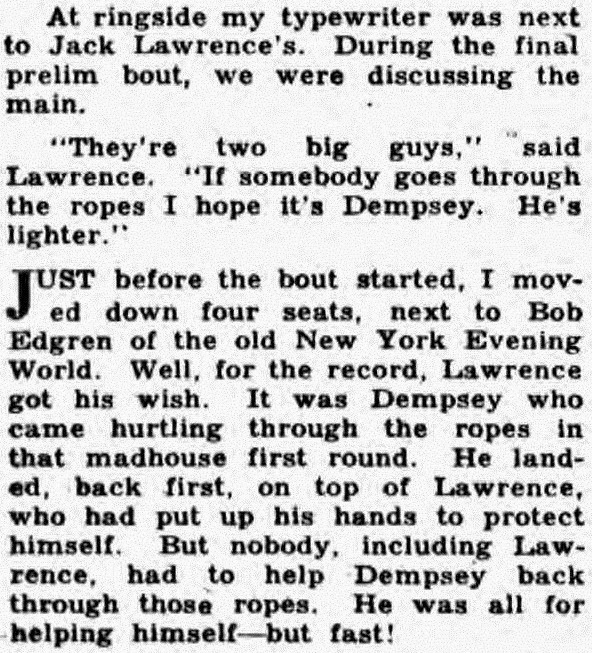 In 1960, another great columnist, Westbrook Pegler, wrote about his friend Jack Lawrence's help for Dempsey. Great story, I feel a bit sorry for Firpo. Incredible story! Chances are, that Corona 3 weighs even less than today's laptops. A wonderfully entertaining post, and a great story to accompany the show and tell of my Corona 3.